GPR uses high-frequency (usually polarized) radio waves, usually in the range 10 MHz to 1 GHz. A GPR transmitter pushes electromagnetic energy into the ground. When the energy encounters a buried object or a boundary between materials having different dielectric constants, it may be reflected or refracted or scattered back to the surface. A receiving antenna can then record the variations in the return signal. The principles involved are similar to seismology, except that electromagnetic energy is used instead of acoustic energy, and energy may be reflected at boundaries where subsurface electrical properties change rather than subsurface mechanical properties as is the case with seismic energy. The electrical conductivity of the ground, the transmitted center frequency, and the radiated power all may limit the effective depth range of GPR investigation. Increases in electrical conductivity attenuate the introduced electromagnetic wave, and thus the penetration depth decreases. 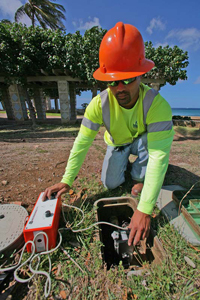 Hawaii Geophysical Services, LLC offers a wide range of electromagnetic (EM) utility locating services for the construction and environmental industries. Since its inception in 2003, we have employed EM technology to quickly and accurately locate known, as well as unknown underground utilities and anomalies. The HGS team of technicians and engineers travel throughout the Pacific Rim Region for utility locates on a regular basis. With years of experience, HGS has employed high‐end equipment in a variety of applications. New surface-penetrating radar equipment is transforming the task of locating concealed pipework, post tension cables and rebar. This technology is an advanced form of ground-penetrating radar that detects rebar, tendons, metal and plastic conduits, glass-fiber cables, voids and wood embedded in concrete to a depth of 300 mm. This technology is able to provide a real-time view of objects inside concrete in both 2D and 3D using a built-in screen. The traditional method of locating things like rebar or tendons is to drill test-holes in selected areas. This is potentially dangerous, as you can easily hit a tendon and damage it. This new technology allows for the location of hidden tendons within a few millimeters. Using a GPS Total Station, a record of the locations can also be provided by using control points in the floor, setting out positions on ceilings and of corresponding slabs. Besides being non-invasive and non-destructive, radar scanning is also quick and accurate. This technology allows tendon positions to be located to within 20 mm. Our scanner visualizes the data in real time, which makes it extremely user-friendly. Some of our customers estimate that they have achieved something in the order of a 30 to 50 per cent saving on our fees compared with other methods of locating. They have said that using conventional methods would have taken considerably longer and the results would not have been as clear or concise. 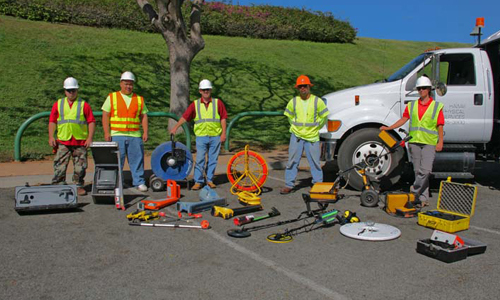 Utility Locating is the process of identifying underground public utility mains. Because of the many different types of underground lines, different detection and location methods must be used. For metal pipes and cables, we use electromagnetic equipment. For other types of pipe, such as plastic or concrete, we use radiolocation or ground-penetrating radar. You can depend on us as your utility locators. Utilities Mapping is important because current maps are often wrong – if they exist at all. Sometimes utility pipes or cables are relocated during repairs or renovations, but maps are not updated. Sometimes maps represent proposed plans that don’t show as-built locations. Sometimes, old maps are simply lost or have disintegrated. Potholing is the practice of digging a test hole to expose underground utilities to ascertain the horizontal and vertical location of the facility. The horizontal and vertical position of the exposed facility must be tied to a survey benchmark or permanent above grade feature. Keyholing is pipeline maintenance using small hole techniques, where work is done from above ground through a small opening called a keyhole. This can easily triple productivity compared with conventional open pit repair methods, and is far safer as well. Air Excavation turns a backbreaking, messy, and dangerous job into a fast, simple, and safe process. Utility professionals rely on air-vacuum excavation for locating underground utilities, and compared to systems that use water, air offers higher performance in most soils, greater efficiency, lower cost, and is less invasive than water. Subsurface Utility Engineering (SUE), also known as Subsurface Mapping, is an engineering process that incorporates new and existing technologies to accurately and comprehensively identify, characterize, and MAP underground utility facilities early in the development of a construction project. This process includes dissemination of the resulting underground utilities information to the right people at the right time, so that cost-effective design decisions can be made and quality levels of information can be depicted on design/construction plans. Subsurface utility engineering results in substantial savings to government agencies, utilities, and taxpayers/ratepayers. RFID technology provides the capability to store a unique identification (ID) number and some basic attribute information, which can be retrieved wirelessly when the markers detect a radio signal from a remote reader. This technology has the potential to offer utility operators and owners a unique opportunity to help optimize the management of utility installations within the right of way (ROW). It could also offer the opportunity to better manage other ROW functions (e.g., outdoor advertising, parcel information, etc. ), as well as asset inventory and management needs in connection with infrastructure (e.g., communication ducts, cable, boxes, manholes, signs, survey/ROW monuments, etc.). High Rate (HR) sand filters have filtration flow rates from 12 to 20 gallons per minute. The filtration media is silica sand. The jagged edges of the silica sand lock and overlap trapping debris in the top 6-12 inches of the sand bed. During backwashing the sand bed is lifted up and tumbled and the lighter debris is washed to waste. In swimming pools the media size is customarily #20 silica sand while in aquariums, water features and ponds the media is customarily larger, #50 or so. In these types of displays usually there is a bio-filter of some kind working in conjunction with the sand filter. In general it is recommended that sand be changed about every 7 years or when the water quality has degraded to the point where visibility no longer meets Health Department standards. Sand wears out because of backwashing during which process the jagged edges are worn away by the tumbling action. Excessive backwashing speeds this process. Another reason for changing sand has to do with the chemicals that are added to the swimming pool or body of water to maintain either sanitation (in swimming pools) or water balance. Operators often sanitize using calcium hypochlorite and adjust Calcium Hardness in the water balance using Calcium Chloride. Calcium, being the least soluble mineral can drop out of solution and coat the sand bed prohibiting the water from flowing through the sand, thus forcing the water through the space between the tank and the sand, a process called channeling. When either of these conditions exist, the sand needs to be changed. Finally, if an operator sees sand at the point where the filtered water returns to the body of water, this is usually indicative of a malfunction in the laterals of the filter, necessitating the removal of the sand for investigation/repair. Cloacina designs and manufacturers package wastewater treatment plants and industry equipment. They take proven technology and components and integrate them into a superior package of either stainless steel or Fiber-Reinforced Polymer (FRP). Every treatment solution is designed specifically to meet the client’s discharge permit, available space, and facility aesthetics while incorporating the following design philosophies. Hawaii Geophysical Services is proud to include Cloacina among our family of solutions for Hawaii’s water needs projects. Cloacina selects the very best and most durable components for conveying and treating wastewater and then packages them in a superior stainless steel structure designed to outlast competitors’ coated steel plants by decades. Rust, corrosion and failed coatings are ancient history with Cloacina’s stainless steel package treatment facilities and their unparalleled warranty. Long after competitor’s coated steel package plants have been recoated and removed from service, their stainless steel plants will still be standing – monuments to Cloacina’s superior design, material selection and construction. Contact us to learn more about this solution for your water treatment needs.